First Brexit. Now on to the Continent. Just days after U.K. voters shocked the world with their decision to exit the European Union, Spain’s general election on Sunday kicked off a 15-month run during which the Eurozone’s four-largest economies hold critical votes. We believe mainstream parties will retain control of government, but discontent is running high, and protest parties will continue to grow in influence. Europe’s stability and unity are at stake and the best response would be the immediate implementation of an effective growth strategy and a thorough reform of EU governance. Unfortunately, the electoral calendar makes this unlikely. On the upside, we see the risk of domino referenda on EU membership as minimal over this timeframe. Did Brexit scare Spain into status quo? Six months after an inconclusive general election, Spain just elected a new Parliament. Defying the polls, the traditional parties ­— the incumbent Popular Party (PP) and the Socialist Party (PSOE) — came out on top and in the PP’s case with much better results than last December. Meanwhile the new parties fell well short of expectations. Still, like in December, the leading parties didn’t come close to an absolute majority, implying difficult negotiations in the weeks ahead. Scenarios include a grand coalition of PP-PSOE and center-right Ciudadanos, or more likely a minority government led by incumbent PM Mariano Rajoy. Such a government would not be unstable but would find it difficult getting meaningful economic reforms through parliament. 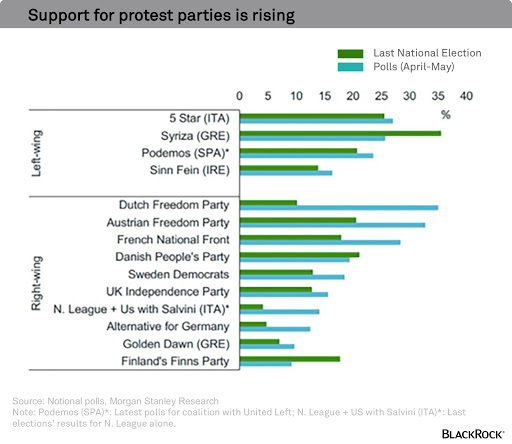 Given also the need for an austerity budget to comply with European rules, growth is likely to weaken, meaning the protest parties will continue to strengthen and may well be strong enough to take over in a couple of years. Still, we see some near-term upside for Spanish markets as the threat of a government led by coalition protest party, Unidos Podemos, subsides. Italians will go to the polls in October over a constitutional reform that PM Matteo Renzihas made the centerpiece of his agenda to jump start an economy that hasn’t grown meaningfully since 2000. We believe Renzi will win the referendum, boosting Italian asset prices. But were the currently fragmented opposition forces to unite, they may well achieve a no victory, triggering the PM’s resignation. We see this as only a slight risk, but not one to take lightly since a political crisis in Italy would have immediate economic and financial repercussions that could threaten the entire Eurozone. France is gearing up for the most wide open presidential election in modern history come April. Incumbent and deeply unpopular Socialist Francois Hollande, should he choose to run, will compete in a primary of the “governmental left” that is deeply divided between a pro-market minority and a large, unreformed leftist group. The mainstream Right holds a primary in November with multiple candidates but only two possible winners: former President Nicolas Sarkozy and former PM Alain Juppé. Amid this wide-open field, the only politician at this stage forecast to be present in the second ballot in virtually all scenarios is Marine Le Pen, leader of the populist, xenophobic, and anti-Europe Front National. While she is not expected to come close to winning, her ideas will influence other platforms. The only near-certainty is that until the election is over, France will not be a leader in pushing forward a growth and reform agenda at the European level. Upshot for French assets: neutral to negative for now; revisit closer to the primaries in light of binary outcomes. Angela Merkel is widely expected to remain as Chancellor after a September 2017 general election, though possibly at the helm of a somewhat different coalition. But AfD, the populist, anti-Europe and anti-immigrant party, is likely to increase its share of the votes enough to be represented in parliament. And to constrain Merkel’s room for maneuver in exercising the leadership only Germany is capable of in the critical period ahead. None of the Big Four countries will be in a position to push forward a pan-European growth and reform agenda over the coming 15 months. This means the burden of supporting growth will continue to fall primarily on the ECB — with all the negative side-effects that implies, and populist forces will keep strengthening. So it will be urgent that newly elected or comforted governments change gear and implement deep reforms, both nationally and at the European level. Specifically, we are looking for completion of the single market for services, product market reform, labor market liberalization and completion of fiscal and banking union. Nearly 50 years after the EU was founded, time is running out for the project to show it stills works for the people on the street. About the Author: Isabelle Mateos y Lago is a global macro investment strategist in the BlackRock Investment Institute. She is a regular contributor to The BlackRock Blog.